On Jan 10th, Chinese Ambassador to Indonesia H.E. 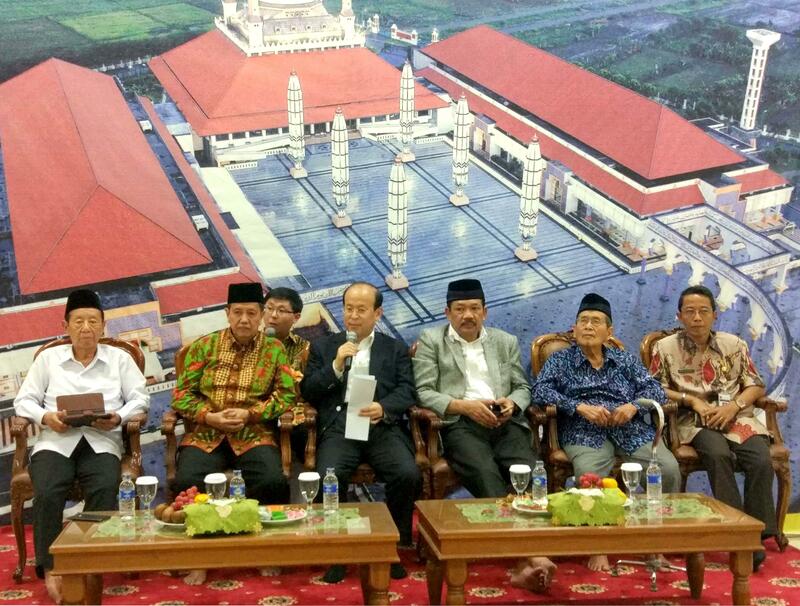 Xiao Qian visited the Grand Mosque in Samarang, Central Java, during his working visit to the Central Java province. Ambassador Xiao Qian briefed the local Islamic community on China-Indonesia relationship, China’s policies regarding ethnic groups and religion and issues related to Xinjiang, and exchanged ideas with them. Chairman of the Administrative Committee of the Grand Mosque Noor Ahmad, Chief of Council Ali Mufiz, Assistant to the Governor of Central Java Herru, regional representatives of NU, Muhammadiyah, MUI and other major Islamic organizations, chief of major higher education institutions in Central Java were present. 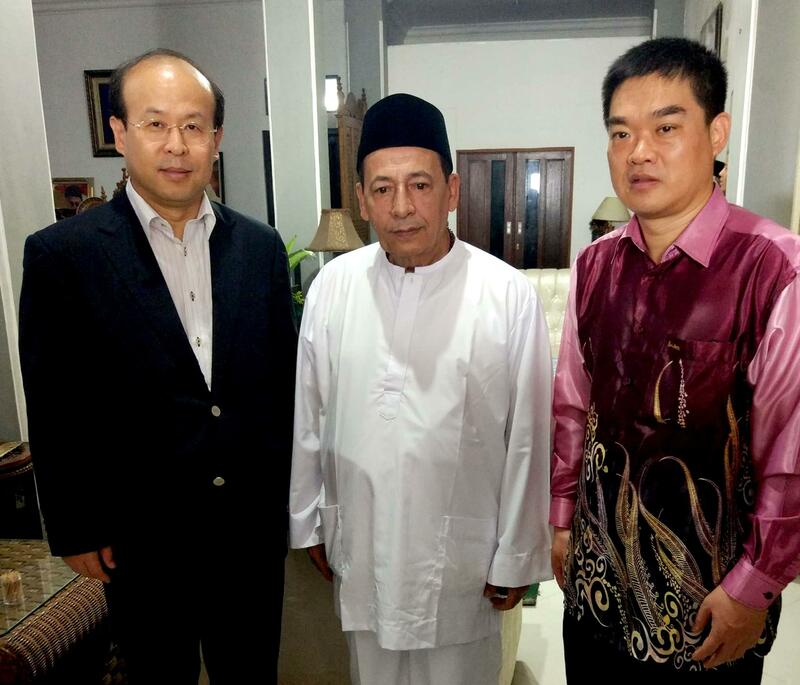 China’s Consular-General in Surabaya Gu Jingqi visited the mosque together with Ambassador Xiao. Ambassador Xiao said China and Indonesia enjoy a long history of friendship. In recent years, under the strong leadership of President Xi Jinping and President Joko Widodo, the China-Indonesia Comprehensive Strategic Partnership has entered a new era of rapid development. President Xi visited Indonesia twice while President Joko visited China five times. The two leaders have established a sound working relationship and personal friendship. Now China is the largest trading partner, the biggest source of tourists and the de-facto biggest source of foreign investment to Indonesia. The two countries have ever closing exchanges and cooperation on culture, education, tourism and at the regional level. Indonesia hosts the biggest Muslim community in the world. China is willing to strengthen communication and exchanges with Indonesian Muslims to forge better mutual understanding and build friendship, thus consolidate popular support for China-Indonesia relations. Ambassador Xiao said, Chinese navigator Zheng He, who was also a Muslim, visited Samarang and other parts of Indonesia more than 600 years ago. His visit kindled the friendship between China and Indonesia. As Chinese Ambassador to Indonesia, Ambassador Xiao said, I am willing to follow his steps and continue to bring to Indonesia the friendliness of Chinese people. Though not a Muslim myself, I am not a total stranger to the Islam religion. My hometown Taiyuan in Shanxi Province has an old mosque of over 1300-year history. My home was right beside the Mosque. I have a lot of neighbors, schoolmates, and friends who are Muslim. China is home to 23 million Muslims, 35,000 Mosques and 56,000 imams, which leads the world in terms of average. Chinese Muslims and people of other ethnic groups or religions are one big family and are friendly to each other. All of them live together, communities grow together, and contribute to the development of China together. Chinese Muslims enjoy full freedom to engage in normal religious activities, which is solemnly protected by the Chinese Constitution, by Chinese laws and government. China, just like Indonesia, is a big country with vast land, and diverse ethnic groups, religions, and cultures. It is essential to protect each ethnic and religious groups to maintain stability and social harmony. 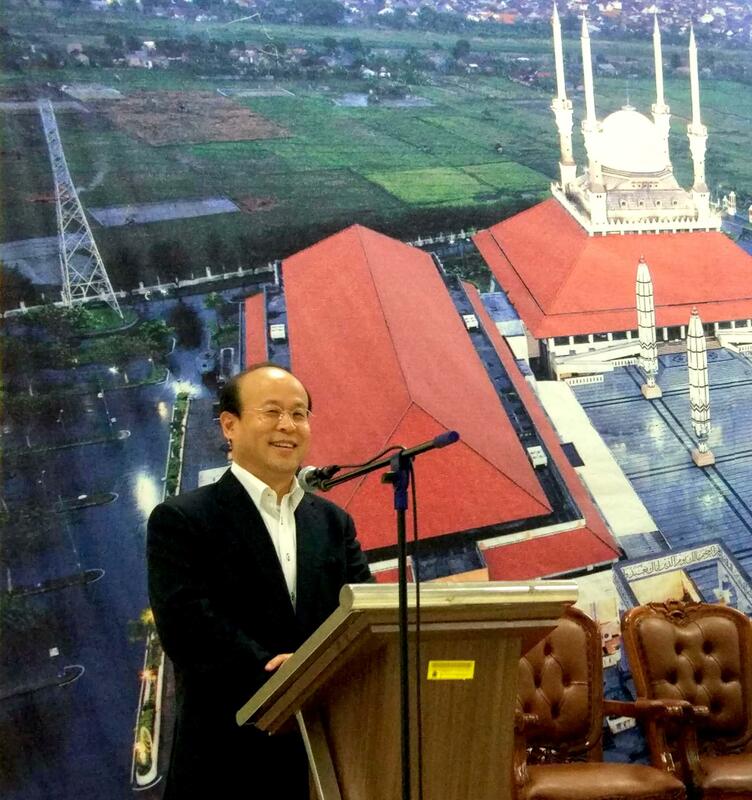 In recent years, China has established a sound relationship with NU, Muhammadiyah and other major Islamic groups, including the Grand Mosque of Central Java. We have invited many Islamic leaders to visit China. They witnessed with their own eyes that there is no problem to engage in normal religious activities for Chinese Muslims in different parts of China. Ambassador Xiao said Xinjiang is a region of diverse ethnic groups and religions where the majority population is ethnic minorities. Among its 24 million people in Xinjiang, 14 million is Muslim. They belong to Uygur, Kazakh, Tajik, Kyrgyz, and many other ethnic minority groups, and Uygur is only part of them. The overwhelming majority of Uygur people in Xinjiang support national unity and ethnic solidarity. In the meantime however, violence, terrorism, separatism and religious extremism forces have taken strong hold in Xinjiang for a long time. There are extremely yet few Uygurs who have been trying to separate Xinjiang from China. They have resorted to violence and terrorism, and staged several violent terrorist attacks in China, not only brought suffer and pain to innocent people of other ethnic groups but also took lives of their Uygur Muslim brothers and sisters. It is evident that the so-called Xinjiang issue is not a religious one but a political one. It is rather a rivalry between unity and secession, and between peace and violence. For those very few unrepentant violent terrorists, the Chinese government has taken measures following the law to resolutely uphold national unity and territorial integrity, maintain social security and protect its people. Regrettably, some western countries deliberately, in disregard of facts, manufactured and spread rumors through media and the internet in an attempt to undermine the friendly relations between China and the Islamic world by hyping up issues related to Xinjiang. In fact, China is a sincere friend to the Islamic world. China has never invaded nor occupied any Islamic country, neither in West Asia, South Asia nor in the Middle East. On the issue of Palestine, which is a widely-shared concern in the Muslim world, China has been standing with the Palestine people in the past several decades regardless of the difficulties and has firmly supported the just cause of the Palestine people. On the contrary, some western countries in question, not only willfully invade or occupy Islamic countries but also take bias and unjust stance on relevant religious issues. China is a friendly neighbor of Indonesia. Our two countries both object to terrorism and secessionism and has been supporting each other on issues concerning respective sovereignty, territorial integrity, and homeland security. China commands the principle and position that the Indonesian government has been upheld on issues concerning Xinjiang. China has been firmly supporting the Indonesian government on the Papua issue as well. Ambassador Xiao said, as for the vocational education and training institutions that a lot of people are interested to know, such institutions are part of the measures to eradicate extremism that the government of the Xinjiang Uygur Autonomous Region has been taking by learning from successful anti-terrorism experience in the world. The vocational education and training institutions aim to provide opportunities of free vocational education for those who are prone to be influenced by extremist ideology, especially the young people. The institutions help young people to gain knowledge of the lingua franca of China and Chinese laws, as well as vocational skills such as clothing and footwear making, food processing, electronic product assembly, typesetting and printing, hairdressing, e-commerce, cooking, etc., so that they will gain expertise in an area and make a better life for themselves and their families. Such training efforts have born good fruits and gained support and applause by the vast majority of Uygur people. Recently some foreign Ambassadors, including Indonesian Ambassador to China, were invited to visit Xinjiang to obtain first-hand information of these vocational education and training institutions so that they can tell the international community the full truth on the ground. China and Indonesia are good friends. The two sides can totally increase mutual understanding and mutual trust through candid and friendly communication and exchanges. We welcome friends from Indonesian religious communities to visit Xinjiang, to see with your own eyes what’s really happening there. We believe it will help the Indonesian society to gain an objective and fair understanding of Xinjiang. During the Q&A session, Ambassador highlighted that Uygur and Muslim are two different concepts. The fact that 23 million Muslims all around China live their normal lives prove that China’s policy towards Islamic religion is not problematic. The Chinese government has been taking preferential policies and supportive measures towards Xinjiang for a long time. These policies and measures include regional autonomy, support from eastern provinces who enjoy fast economic growth to Xinjiang, special treatment under the family planning scheme and preferential treatment in the area of education. These measures have helped Xinjiang to achieve substantial development in economy and social development. The absolute majority of Xinjiang Uygur people support national unity and object to secession and violence. To the very few stubborn Uygur separatists and violent terrorists, the Chinese government has taken necessary measures in accordance to law. The vocational education and training institutions in Xinjiang aim to help and protect the young people who are prone to be influenced by extremist ideology. It is a preventative and exploratory measure, not a compulsory one, even less targets Muslims. Therefore, the Xinjiang issue that many people care about is actually not about the freedom of religion of Uygur people in Xinjiang, but rather caused by the deliberate attempts by some violent terrorists to separate Xinjiang from China through hyping up false information. It is an issue of politics, not religion. Chairman Noor thanked Ambassador Xiao for his thorough introduction. Chairman Noor said it will help the Islamic community in Central Java to understand the real situation in Xinjiang, send the right information to Muslims and strengthen solidarity and friendship between the two countries. Currently, the Indonesia-China relationship enjoys sound development. The two countries have ever closing economic cooperation and people-to-people exchanges. The Islamic community in Central Java is willing to continue strengthening exchanges and cooperation with China on religion, education and other areas, and forge greater mutual understanding and friendship. 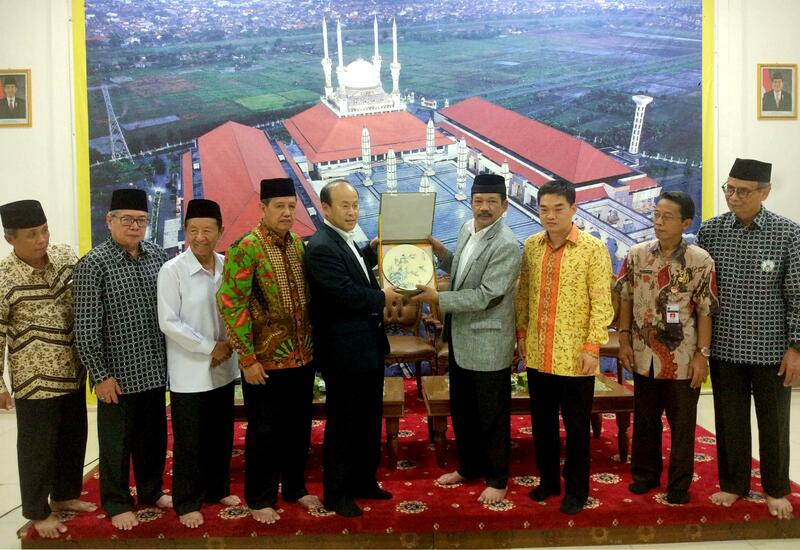 On 12th, Ambassador Xiao visited Pekalongan and met with local Islamic leader, former MUI Central Java President Habib Luthfi. Ambassador Xiao briefed him on the current China-Indonesia relationship and the situation in Xinjiang. Habib Luthfi said, every country and government has the right and obligation to defend national territorial integrity and sovereignty, and resolutely counter secessionism and terrorism. I support the efforts to strengthen exchanges between religious communities among the two countries. When the two peoples maintain close and friendly ties, there is no place for rumors to grow.